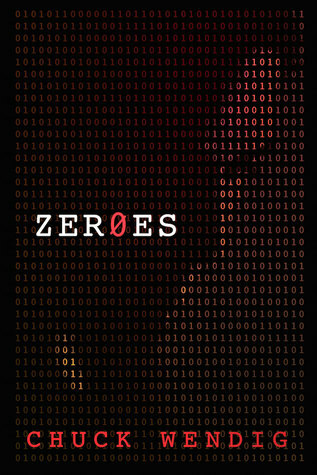 My latest book review is of one of the books I picked up in my last post: Zeroes by Chuck Wendig. Chance Dalton is small time, a nobody who unveiled a dirty little secret in his football loving town. DeAndre Mitchell is a credit card skimmer and black-hat hacker who’s trying to make a better life for his Mom. Aleena Kattan is a Spring Arab hacktivist. Reagan Stopler is an online troll. Wade Earthman is a veteran, a survivalist, and an old-school cipherpunk with a network of secrets. When these five are detained by the US Government to work as white-hat hackers in a secret complex called the “Lodge”, they become involved in something none of them ever expected, and realize the stakes are much higher than a lengthy prison term. The five “Zeroes” are informed that every system is mirrored and tracked, and every aspect logged: every key tapped, every nudge if the mouse, even the way that the eyes twitch. This book has a great hook (side note: I love the way the chapter is even named “The Hook”). Five – seemingly unrelated – hackers are detained and thrown into a secret location together to uncover secrets for the US Government. Of course the secrets they uncover are going to put them in more trouble than the actions they took that landed them in the Lodge in the first place. The introduction to the characters was nicely handled, and their personalities and motivations made abundantly clear. Early on I wondered how some of the chapters fit into the overall story, but by the end everything was tied in and made sense. In a multi-POV book, naturally you are drawn to some characters more than others, but I enjoyed being able to get inside each character’s head. One thing that is hard to do is make the twists and turns in a book unexpected, but Chuck handled them well. Another thing Chuck does well is his use of humour. There was a lot of it sprinkled in each chapter, but at appropriate times and not enough to be distracting. Zeroes is a page turner and I enjoyed it immensely. 4 Stars. While I am here, I should mention that at the end of Zeroes there is a teaser for the next instalment – Invasive – which was released this week. Invasive isn’t a sequel to Zeroes, but is set in the same world with some common characters, or so I’ve read. 😉 I’d love to say I’ll rush out and buy it, but I have this weird compulsion to have books by the same author in the same format, which means I will have to wait until the paperback is released in Australia. You can see more on Invasive’s release, and where to by it, here on Chuck’s Blog.